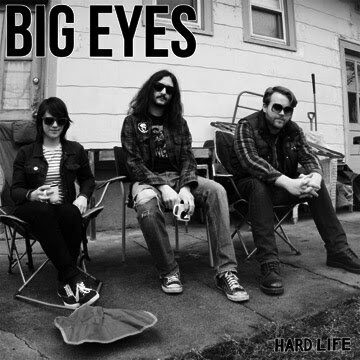 Big Eyes was from New Jersey. After some member changes and a cross-country move, now they call Seattle home. Recently I've been seeing that this band is doing a lot of touring and getting some recognition for their hard work on the road. This band has something that sounds like a mix of Screaming Females and Iron Chic. At times they are representing a full-on up beat and catchy pop sound, and at other times delving into more experimental grounds. There's something just a bit off key and monotone with the female fronted vocals and I suppose this adds that bit of indie charm that I hear in some bands like this. When the songs take a serious and gruff vibe like on "I Know You're Wrong" or "Pretty Sure" I can almost picture a young Joan Jett vibe where this song is played in some rowdy, smokey club. They can also bring you to that pillow-soft, cutesy-pop landscape with songs like "Why Can't I" which almost sounds like the Ramones on a slower speed. The musicianship is pretty creative and has a way of setting the band apart. Noodling guitars and exploratory bass lines give the songs their own character. This is all backed up by some good foundational drumming. I think that may be the bands strongest characteristic. I would look forward to hear a better recording from these folks.